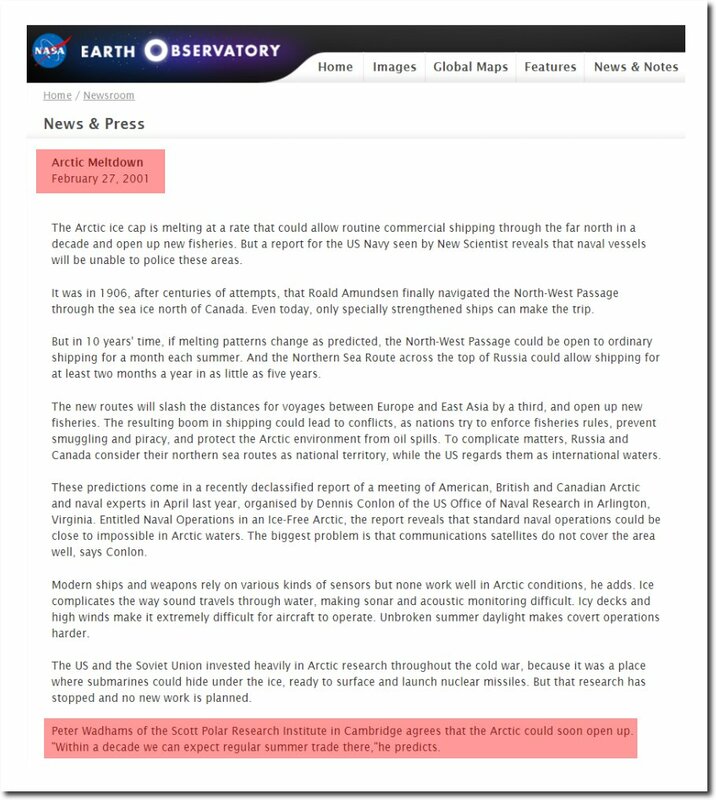 Peter Wadhams Grants The Arctic Another Reprieve! In 2001, Wadhams predicted the Arctic would be ice free within a decade. Wadhams later pushed the date back to 2015. 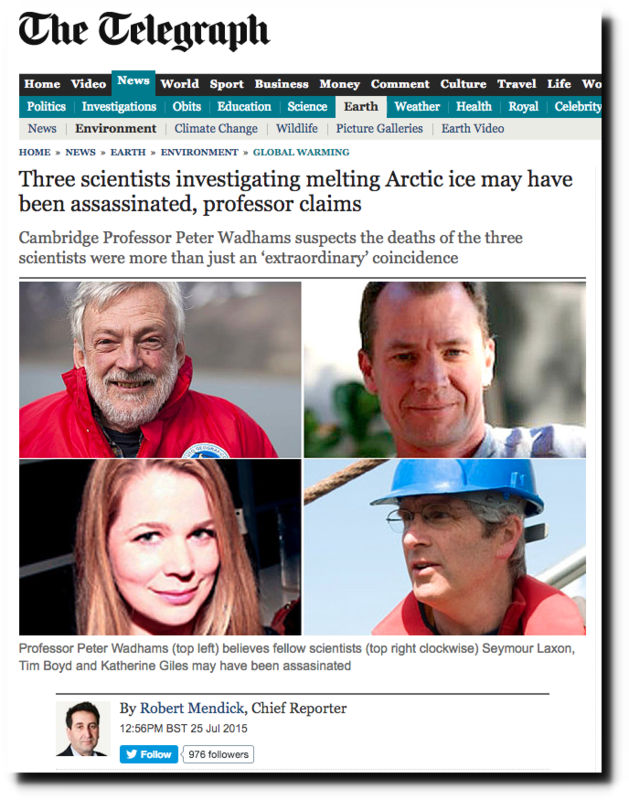 Wadhams also believes climate skeptics are assassinating climate scientists. Being paranoid, incompetent and dishonest makes you a world renowned climate expert. But telling the truth gets you viciously and relentlessly attacked by the left. 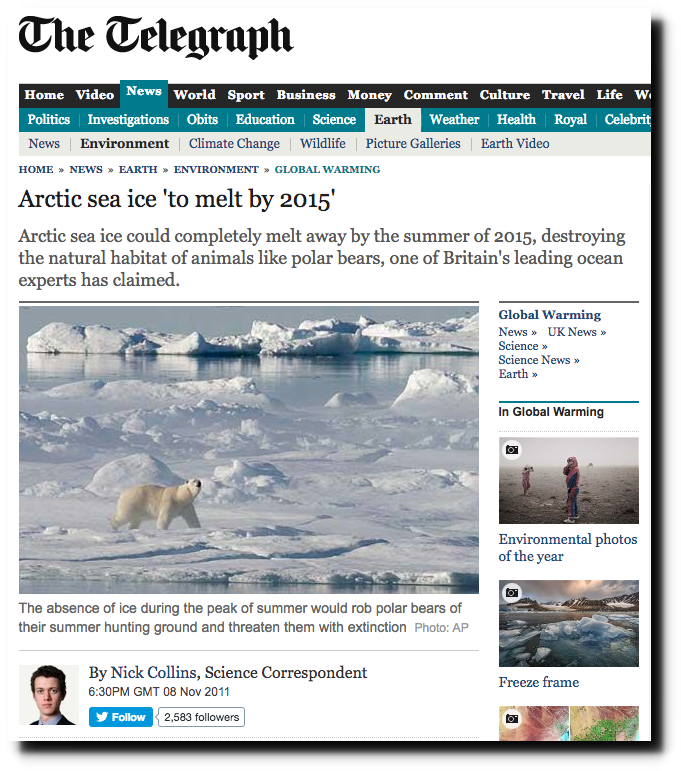 16 Responses to Peter Wadhams Grants The Arctic Another Reprieve! Being paranoid, incompetent and dishonest makes you a world renowned climate expert. 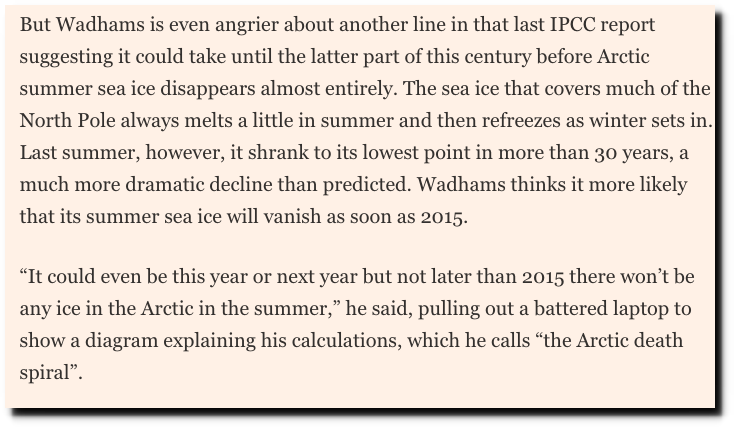 You forgot to mention Wadhams being an angry beaver because the IPCC had the audacity to make a prediction that was not in line with his pet fantasy. Basically being truly unhinged is what qualifies one to be a climate expert. Climanumerologists, is there anything that they don’t know? than the ones about a huge horde of climate scientists. 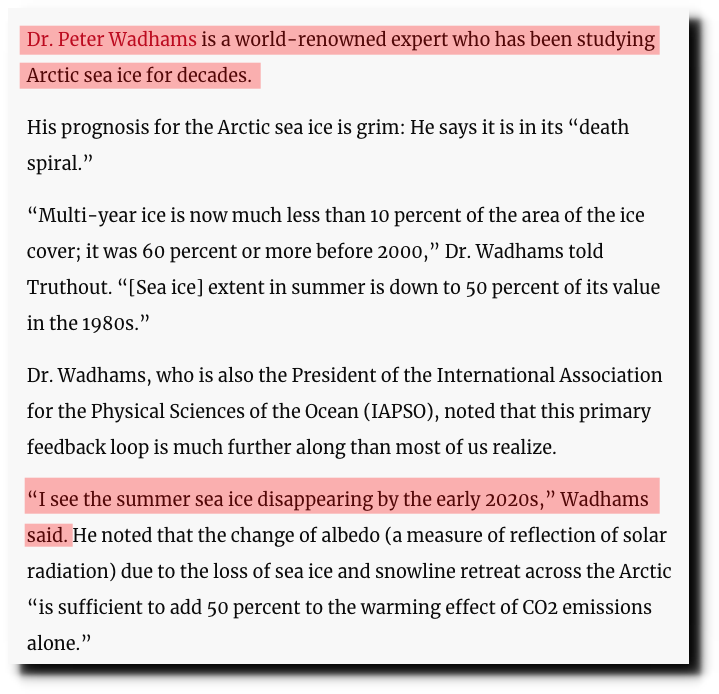 ” who has been studying the Arctic Ice for decades.” Obviously, at this melt rate, Wadhams will be OK to receive his pension before that happens. I read up Gile’s death. She was cycling through a busy intersection and seems to have collided with a truck turning left. The truck’s left turn signal was on and apparently there was a caution beep from the truck as well. Don’t see how this was an assassination attempt. More alarmist scare tactics. Many Boulder cyclists ride like they have a death wish. Clearly an assassination. Boulder pedestrians, cyclists, skateboarders and scooter riders are conditioned to believe that it is the car and truck drivers’ responsibility to look out for them. And when they get into their Subarus and Audis, they use social media to notify the world that they are not responsible for their larger machines, either. Peter Wadham just wants to be debunked to get publicity or something. What is the point of these forecasts or prophecies that never come true? What I learned from watching Phil and Griff here (while trying to avoid them most of the time) is that they are language adepts. I thought that observation was very interesting and gave me some insight about how to read pro-CAGW articles. Headline: Leaning Tower of Pisa to go way of Arctic Ice. Sub-heading: The Leaning Tower of Pisa’s rate of inclination is increasing which research suggests has an unequivocal link to Climate Change. My naiver self might have spent 20 minutes or so trying parse the story to get a better understanding of what is going on, as it triggered my emotions about losing an iconic cultural landmark. Now, before getting into any of the subject material, I try to spot the HINGE WORD(s) and this saves me a lot of time. So, instead of getting emotionally involved with the subject matter, I turn it into an exercise of trying to stop the “hidden qualifiers”. A skillful author will cleverly obfuscate them, whereas they will be more apparent from a hack author. Anyway, try it yourselves… it definitely works and adds a new dimension to reading articles like the ones Tony posted above. I call them weasel words. And those are the same people that say that we are paranoid? Does he even know what a spiral is? Is it spiralling in, only to disappear up his own fundament, or spiralling out to infinity? Time for a picture of that submarine at the North Pole, USS Skate in 1958. On the ice free surface. 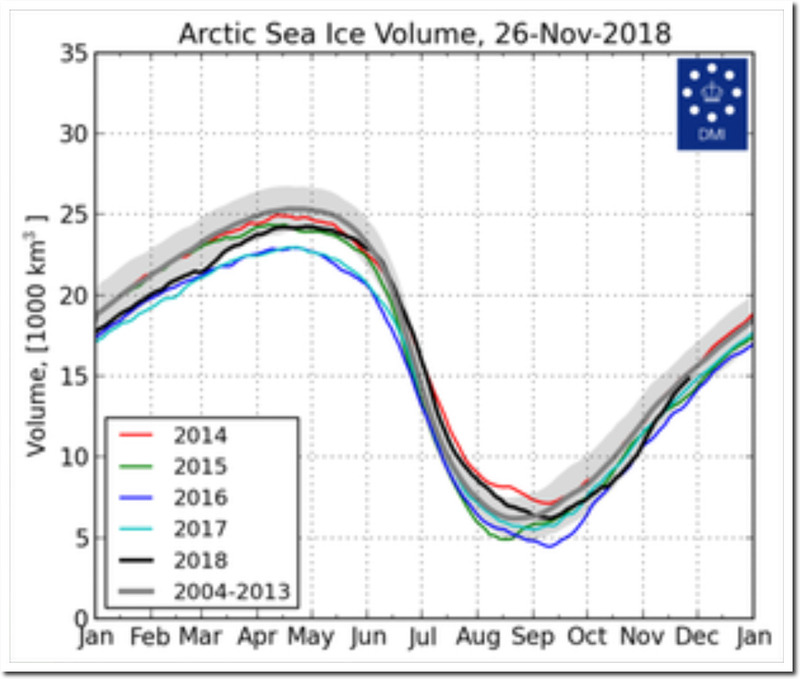 Professor Wadhams may not have been accurate in his timing for the end of summer sea ice in the Arctic, but he knows a hell of a lot more than any of those who have commented here about the subject and the trajectory of summer sea ice there. It is toward disappearance if we do not address Climate Warming. It’s called prudence to take heed. It’s called being conservative, as in conserve the Earth and its ecosystem health that supports us, so we have a future. Mocking those who have been and are documenting the threats is not very smart. Is there a school where clowns like you are trained? LLS, what do we do about those pesky tides? And can’t we get that Sun to rise and set the same time everyday? It is so annoying when it rises too early or sets too late. Thank God we have people like you to lead the way against wind mills. Regardless of how much Wadhams may know, just how many times has he ever been accurate with his predictions concerning loss of arctic sea ice? And since his predictions have been so wrong, maybe he really doesn’t know as much as you think he knows.